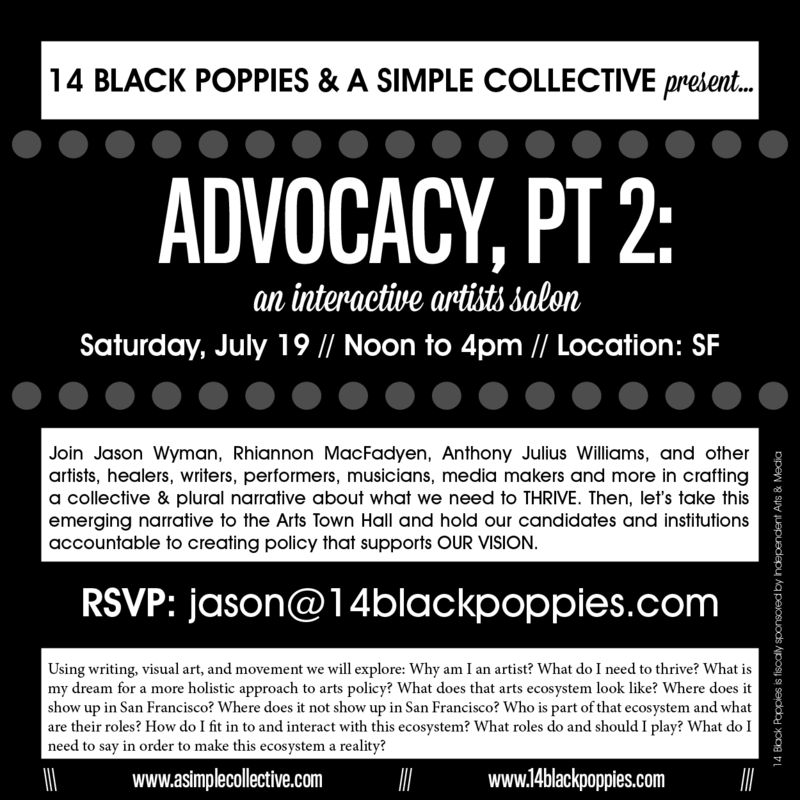 Join 14 Black Poppies and A Simple Collective for Advocacy Pt 2: An Interactive Salon, as we host an afternoon of writing, visual arts, and performance workshops with the goal to create a plural, overarching narrative about artists in San Francisco that can be distilled into simple, sequential talking points that will be taken to town halls, candidate forums, public hearings, etc. In February 2014, 14 Black Poppies and A Simple Collective founded an open artist cohort with the goal of sharing projects and encouraging collaboration within the creative community. Over the course of three salons, we chatted with artists over cocktails or coffee about their projects, their needs, their opportunities, their stories. As we listened, it became clear that artists need a space to cultivate voice, find connection between form and content and community, and synthesize their experiences. Additionally, we found that artists are already taking action within their communities, and they want to find a more coordinated way to speak about the many issues that intersect with our lives, livelihoods, and communities. On July 19th, we transform our more conversational salon into an interactive space of exploration, inquiry, synthesis, and pluralism. And we will be doing all of this through artistic practice, because what good is advocacy if not rooted in our practice. Why am I an artist and what do I need to thrive? What is my dream for a more holistic approach to arts policy? What does a healthy art ecosystem look like and where does it show up in San Francisco? Who is part of that ecosystem (including myself) and what are their (our) roles? What do I need to say in order to make this ecosystem a reality? After our creative exploration, we will draft an overarching narrative about artists in San Francisco. This narrative will be turned into talking points that can go with us to town halls, candidate forums, public hearings, etc., as a means to synthesize our collective experiences and form a plural narrative. If you have questions, please contact Rhiannon MacFadyen at asc@asimplecollective.com or Jason Wyman at jason@14blackpoppies.com. It’s time our politicians and institutions listen to and work for us, rather than simply report to us.